The property was purchased in 2002 by the current owners, David & Valerie Bathrick. 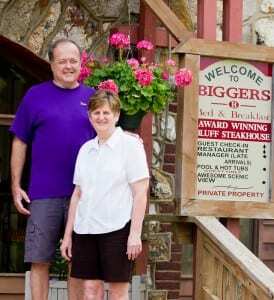 The award winning Bluff Steakhouse was the first of many additions to the Biggers Bed & Breakfast. From the swimming pool and hot tub spa, to the new luxury suites, to the beautiful fish ponds and gardens, everything seems to blend into the God given beauty that abounds on Biggers Bluff.